The British Blues Exhibition will soon be introducing a new newsletter. People who sign up will have exclusive access to a page on the website with news, competitions and offers. Document Records is an independent roots music label based in the United Kingdom. 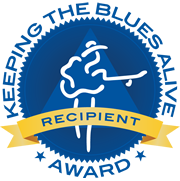 They have been newly awarded one of the annual ‘Keeping the Blues Alive’ Awards by the Blues Foundation in the US. The British Blues Exhibition would like to congratulate the label on this significant achievement and what they have done to earn it. Document Records are famous for specializing in the issue and reissue of a vast catalogue of early recordings of American blues, gospel, spirituals, jazz, and roots music, covering the complete recorded works of numerous artists who have influenced subsequent generations. They also have extensive tracks and albums from the early careers of many of the most famous Blues artists. Big Bill Broonzy, Muddy Waters, Blind Willie McTell, ‘Ma’ Rainey… the list is enormous and the company is celebrated by such famous artists as Jack White. The Document Records website is here.